History: Okra originated in northeast Africa and reportedly grows wild in the upper watershed of the Nile. It was brought to the U.S. in the late 1660s by way of the slave trade or via Europe where it may have been cultivated. The word okra is derived from "nkru" in the Ashanti language of West Africa. The word gumbo is derived from "ngombo" from the Bantu language of southern Africa. Folk Uses: The dried pods of okra have been used in flower arrangements; the roasted seeds serve as a coffee substitute; the juice has been used to stop bleeding and to clean metal; the stem fibers used to make rough cloth or cordage. The raw pods of okra can be applied to the forehead or nose to make a quick Halloween mask. 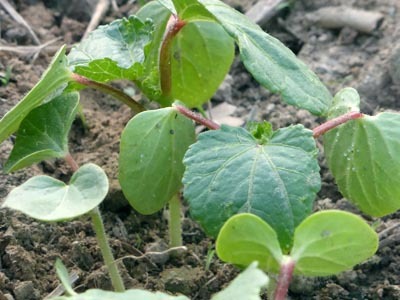 How to Grow: Okra does best on a fertile, loamy soil with lots of added humus. Excess nitrogen will favor leaf production at the expense of pod production. Start seed in pots 2-3 weeks before transplanting outside, or plant directly in the garden once the soil temperature averages 65 degrees F (3-4 weeks after last frost). Sow seed 3/4-1 in. deep and thin to 18 in. apart in rows 5-6 ft. apart. Seed may be slow to germinate. To speed germination, soak seed overnight in water, or abrade the seed lightly with sandpaper to break down the hard seed coat. Pest and Disease Notes: Observe 4-year rotation. 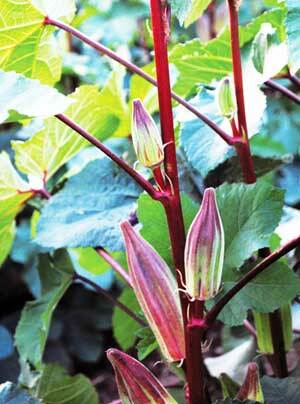 Old varieties of okra tend to have deeper root systems and are more tolerant of root-knot nematodes. Okra grown in rich, moist soil gives the best and longest resistance to nematodes. In years of high grasshopper numbers, grasshoppers may eat lower leaves of plants. Harvest: Harvest pods when 2-4 in. long except as noted; pod tenderness varies over the course of the season. Use hand pruners to harvest. Young pods also can often be snapped off by hand. Wear long-sleeve shirts to harvest--leaves of most varieties irritate the skin of all but a few lucky humans.